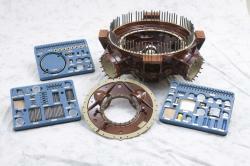 Alpha Q is recognized as an aerospace industry leader of very complex machined and assembled components. Our experience combined with our capability to perform 5-axis milling on cast and forged structures, up to 50-inch cube, has afforded AQI a reputation held by very few manufacturers. We specialize in manufacturing of structural components requiring turning, multi-axis milling, coatings/plating assembly and testing. Components are produced from light alloys such as magnesium, titanium and aluminum as well as stainless steel. Nigata HN80B 5 Axis Horizontal Machining Center with pallet changer, 59" X 47" X 40" work cube. Part shown is 48" magnesium main frame for commercial aircraft application. Pictured is 48" magnesium main frame with HAE coating and enamel paint. 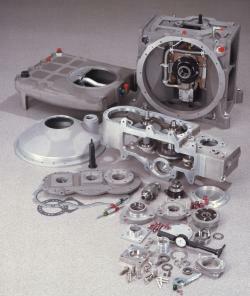 Shown in center of photo is a 174PH SS split compressor case sitting on top (not shown) of magnesium stub frame. Magnesium accessory gearbox and starter housing are attached to outer diameter. UH-60 Main Rotor Housing Assy. magnesium castings machined to exact match fit tolerances with Dow and Rock-hard coatings; 569 hardware details are set up in kits and assembled. TF40/50 gearbox, output and sump assembly. Assemblies consist of 302 separate details. Contribution from 53 different suppliers led to the success of this program. Alpha Q takes 100% responsibility for assembly and in house pressure test, flow test and gear pattern check.